It has been almost seven years since I learned that I have synesthesia. I actually found out about the condition by accident – I was living in San Francisco and one of my roommates was watching 20/20, and there was Barbara Walters, talking to people who had been diagnosed as synesthetes. When I tell people about it I usually get a “you are some kind of circus freak” glance, but truthfully I forget that I have it most of the time, since it has always been part of my life. Synesthesia is a “neurologically-based condition in which stimulation of one sensory path leads to automatic, involuntary experiences in a second sensory path.” In other words, your senses- smell, sight, touch, taste, hearing- get crossed sometimes. Instead of operating independently of one another, they play together. There are over 60 different types of synesthesia, but of the several that I have, the form I experience most distinctly is color graphemic. 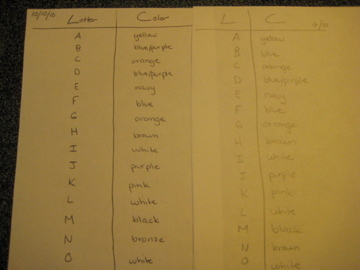 In color graphemic synesthesia, all of one’s numbers and letters are associated with colors. For my whole life, each letter and number has been assigned to a color in my head, and that color does not change. Before I knew about synesthesia I just thought that everyone had their own colors for letters/numbers, and that your color association came from the alphabet magnets you played with when you were a kid, or the 500 count crayon box. But now I know that while my “a” is yellow, most people don’t assign a color to their a. There are some tests you can do to determine levels of synesthesia, and one that I do on myself is to just write out the alphabet a few times a year, with the color of my letter beside the letter itself. Then I compare with the last list and see if anything has changed. Here are my two most recent lists- one from today and one from a few months ago. Now, I see you giving me the circus freak look, but I actually don’t mind the party game that usually ensues after a group of people find out about this. Trust me, this goes on and on and people love it. As I said, I don’t normally spend too much time thinking about synesthesia, but recently I described a certain olive as tasting “purple” and got the circus freak look from a co-worker, and was reminded of my special little gift. 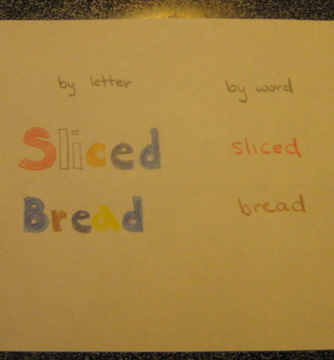 Sometimes when people find out they ask me to write their name in my colored letters – I never really understand this. The colors mean nothing to the other person, they are (selfishly) my colors that will always exist in just my head. But if, after reading this, you’d like to know what color your name is, or play the “what color is desk/stool/pencil” game, I’d be happy to. Fire away. What colors are: Shibby, Chicago, and Head of the Charles Regatta?